In the spirit of ideas worth spreading, TED has created a program called TEDx. TEDx is a program of local, self-organized events that bring people together to share a TED-like experience. Our event is called TEDxVanderbiltUniversity, where x = independently organized TED event. At our TEDxVanderbiltUniversity event, TED Talks video and live speakers will combine to spark deep discussion and connection in a small group. The TED Conference provides general guidance for the TEDx program, but individual TEDx events, including ours, are self-organized. TEDxVanderbiltUniversity (TEDxVandy) will take place on Sunday, November 10th in Sarratt Cinema. Speaker applications are OPEN! This year, we also have a Speaker Nomination Form. Know someone on campus or an alumni with a great idea? Nominate them for this experience. For current Vanderbilt students, staff, and faculty please apply here over on Anchor Link. For alumni, please apply here. To submit nominations, please visit here. Applications are due on April 10th and Nominations are due on April 1st. 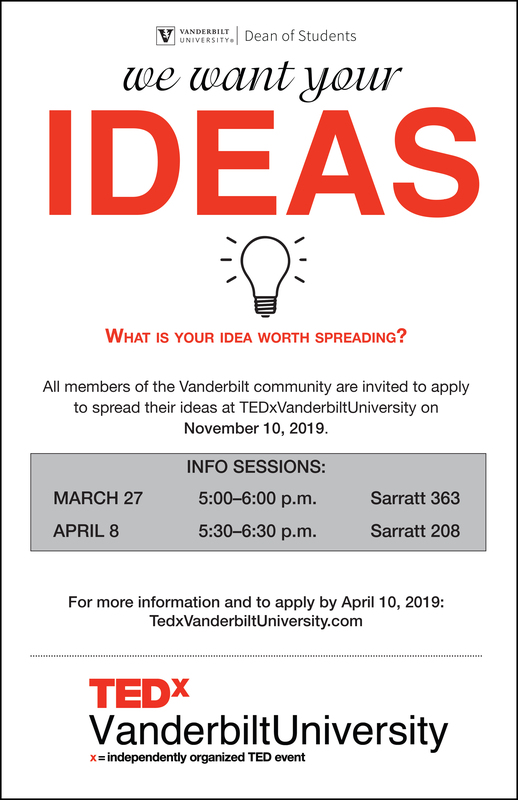 If you’re interested in learning more about what it means to be a TEDxVandy speaker, please attend one of our information sessions on Wednesday, March 27th from 5:00-6:00pm in Sarrat 363 or Monday, April 8th from 5:30-6:30pm in Sarratt 208. Also follow @tedxvandy on Twitter, @vandyleads on Instagram and @vuleads on Facebook for more information.